The aim of this study was to analyze the effect of hypoxia on metabolic and acid–base balance, blood oxygenation, electrolyte, and half-squat performance variables during high-resistance circuit (HRC) training. Twelve resistance-trained subjects participated in this study. After a 6RM testing session, participants performed three randomized trials of HRC: normoxia (NORM: FiO2 = 0.21), moderate hypoxia (MH: FiO2 = 0.16), or high hypoxia (HH: FiO2 = 0.13), separated by 72 h of recovery in normoxic conditions. HRC consisted of two blocks of three exercises (Block 1: bench press, deadlift and elbow flexion; Block 2: half-squat, triceps extension, and ankle extension). Each exercise was performed at 6RM. Rest periods lasted for 35 s between exercises, 3 min between sets, and 5 min between blocks. Peak and mean force and power were determined during half-squat. 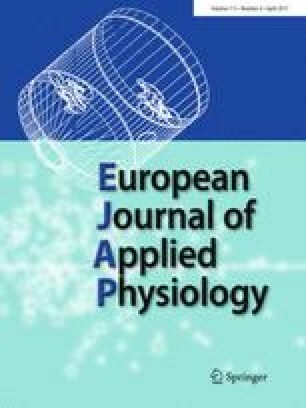 Metabolic, acid–base balance, blood oxygenation and electrolyte variables, arterial oxygen saturation (SaO2), and rating of perceived exertion (RPE) were measured following each block. During the first set, peak force and power were significantly lower in HH than MH and NORM; whereas in the second set, mean and peak force and power were significantly lower in HH than NORM. At the end of the HRC training session, blood lactate and RPE in HH were significantly higher than in MH and NORM. SaO2, pH, HCO3 −, and pO2 values were significantly lower in all hypoxic conditions than in NORM. These results indicate that simulated hypoxia during HRC exercise reduce blood oxygenation, pH, and HCO3 −, and increased blood lactate ultimately decreasing muscular performance. The authors thank Arturo Camacho and Antonio Martínez-Garrido for their help during the testing sessions and all the athletes who participated in this study.